A lovely digital reproduction of a book from England describing a range of card moves. It is profusely illustrated and very clearly describes all basic card moves and many specialties. Twenty chapters deal with subjects such as: The Pass, Location, Palming and Forcing, False Cuts, False Shuffles, False Counts, The Double Lift, Top and Bottom Change, Glide and Slip, Glimpse and Peek, Reversing Cards, Flourishes, Fanning, Front and Back Palm, etc. Learn the right way to do these sleights. Other chapters deal with Presentation, Card Climaxes, Patter, Color Changes, Mental and Gambling Effects. Hundreds of moves, sleights, tricks, flourishes, and methods are given. 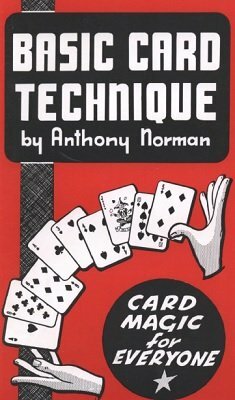 A comprehensive volume on card technique, well written and well produced with over 200 illustrations. When I was invited to write this foreword, I agreed with some misgivings. So much has already been written on the subject that I could not imagine what the author had to offer. This book, however, I find is well titled and is just what it says "Basic Card Technique." The material has been carefully collected for easy reference for the beginner and student of card magic. The author has given a wide selection of methods for performing standard sleights, and introduced to the reader most known methods of prepared cards. References are made to the works of Hugard and Hilliar for those who wish to pursue their studies in later developments. This is not exactly a book for the expert, for he will be familiar with much of the material, but it will save the beginner much trouble and expense in acquiring his knowledge, for this book does not pre-suppose his knowledge of elementary card work, and the student is taken in hand from the beginning through the whole realm of card sleights. Apart from the description of basic sleights, I find very good advice given at the beginning of the various chapters. One piece of advice that particularly interested me and which I have always advocated is that smoothness is often more important than speed. Many otherwise competent card workers sadly lack this desirable acquisition and the student will be well advised to consider this well. This book is particularly recommended to the beginner who does not want to spend a lot of money buying several books to acquire the knowledge contained in this one volume. 1st edition 1968, 77 pages; PDF 197 pages.